The church El Temple Expiatori de la Sagrada Família (Expiatory Temple of the Sacred Family) in Barcelona is the best-known example of Antonio Gaudi's surreal style of architecture . He worked on this building from 1884 until his death in 1926. The towers were originally intended to be three times higher ( intended to be 172 m (564 ft) tall. ) Parts of the unfinished building and Gaudí's models and workshop were destroyed during the Spanish Civil War. Since 1940 the architects Francesc Quintana, Puig Boada, and Lluís Gari have carried on the work. Sculptures by J. Busquets and the controversial Josep Subirachs decorate the fantastical façades. The church has three facades, each with three porches. The Facade of the Nativity, seen here, was completed first. The three portals of this facade are related to the Christian themes of faith, hope, and charity. 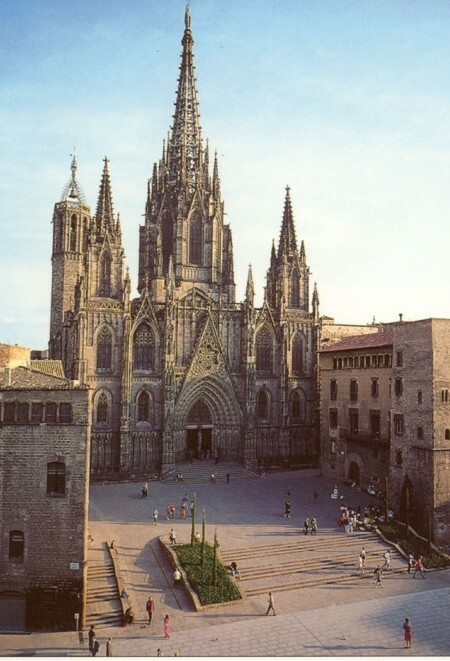 From 1954 to 1976, the facade and the four towers of the Passion (Western side) were completed. Today, the constructed part is open to visitors as well as the small Museu del Temple Expiatori de la Sagrada Família with maquettes and drawings showing the construction process.